A new era was inaugurated with the financial collapse of 2008. The former optimism of near permanent economic growth which would yield benefits to the vast majority in society was dealt a serious blow. While the vast bulk of benefits have gone to the few at the top, the financial catastrophe and the ensuing austerity regimes have made it clear that things are going to be worse for the majority. Essentially, the class basis of our society has been made very apparent. Despite this clarifying event, there has been very little organised response. Awareness of the problem does not necessarily lead to a solution being adopted. The reason for this is not that there are no alternatives, but that there is no movement to win them. The problem, then, is an organisational problem. Alternatives require an organised movement with a clear vision of what it wants in order to obtain them. While our societies are formally democratic, the nexus of social power lies in the economic realm. Economic power can be wielded to deform even the most democratic of societies. Because of this the core aim of emancipation has to focus on the democratic and social control of the economic sphere. 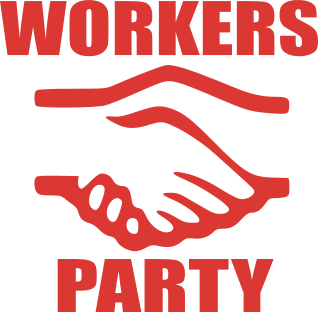 The Workers’ Party is a socialist party, which aims to create a meaningful social control of the economy. The objective of the Workers’ Party is freedom – freedom from oppression. To achieve that we need democratic control of the means of production, distribution and exchange. Economic freedom must guarantee the right of an individual to be free from want; we must then guarantee the right of free expression, social and cultural freedom and the right to fulfilment in people’s lives. These core demands of democratic control over the production process and investment are the age-old historic aims of socialism. Now, it happens that Ireland has a number of socialist parties. So why is it that none of these has managed a significant interest from the general public in their projects? There have been many theories advanced by the left. It has been variously stated that the reason is that socialism is associated with authoritarian regimes, that it is a no-longer fashionable concept, that the idea of the party is dead, that no group should attempt to promote their own ideology, that all we need is good policy and many other ideas beside. We, however, take a different view. Rather, the problem is that socialists in Ireland have largely forgotten what it takes to be a mass party for socialism. Everywhere that a large movement of the left has developed in the capitalist democracies, one also finds serious socialist parties which include a large membership base, influence in many sectors of civil society, presence in the unions, and a significant ecology of supporting institutions and organisations. Further, while all of these parties have peculiarities which derive from their particular locations, their cultural surroundings and their historical context, they all share a number of essential features which must be present in order to be successful. Most importantly, there must be an understanding of the party’s role in social change, a mass orientation, and a long-term vision of change which can boldly put forward the small steps needed to get there. The most successful socialist party in Ireland’s history has been the Workers’ Party, and if we look at its history we can find these same genetic traits were present in the party. In this respect, the Workers’ Party was and is unique. The Workers’ Party come out of a slow process of transformation, from a nationalist project, to one which wholeheartedly embraced anti-sectarian socialism. This process came about with the realisation that national liberation would not be possible without the active engagement of large numbers of people, but even more importantly, such liberation would be an empty signifier if it did not improve the lives of the vast majority. Eventually the Workers’ Party had a membership in the thousands, over 30 branches in Dublin alone, and 7 TDs. Despite the successes in electoral participation by the Anti-Austerity Alliance, and People Before Profit, neither has come anywhere close to this high water mark. But even their relative success belies a deeper problem: neither of these electoral fronts is explicitly socialist. The past success of the Workers’ Party was consequently much more impressive. The prize is freedom. Oppression is the enemy. Our weapon is the people through the Party. The role of the party is to act as a vehicle for mass participation in the struggle for a better society. It is through the party the people articulate and enact their aims. As individuals we may want political change, but it is only by coming together and helping to produce a movement that it will come about. This is in marked contrast with the small left parties in Ireland who for the most part see themselves as a tightly-knit elite who who will ride a wave of discontent and upheaval when the appropriate conditions come along. This spontaneist approach explains away the reason for being small – a tiny size is no real problem – in fact they often see it as a virtue. In reality, no serious penetration of socialist ideas and action into the various corners of society can happen without having a huge number of people who know that they want socialism and are ready to organise to help to bring it about. While these will not all belong to a single party, it is largely the leadership of a single party that enables such a movement to form. A small example of this can be seen in the Workers’ Party’s work on LookLeft. Despite being formally a party publication, content comes from many non-members, meaning that the magazine can act as a common reference point for a broad range of left wing activists. This creation of a platform is because the Party sees its role as leading and helping to build a broader movement. This requires a mass orientation. We need to be looking to involve the greatest number of people cooperatively in our aim. Socialism is a philosophy for me, it’s a science which means in fact the greatest happiness for the greatest number. I don’t think people should be sacrificed for socialism. I think that socialism must begin to develop the minute a socialist government takes over and that, if the people don’t understand or are hostile and begin to resist, it is the duty of the government to educate them, not to force them. It’s going to take a long time in Ireland. The other important feature that distinguished the Workers’ Party from the other socialist groups is that it was “revolutionary” but not insurrectionary. By revolutionary we mean that the aim is the total progressive transformation of society to the socialist mode of production. In this struggle, insurrection is merely a tactic and should not be raised up to be a principle. He [Goulding] had a clear understanding of the difference between revolution and rebellion and recognised that rebellion might well be necessary to complete a revolution or protect a successful revolution, but in the Irish context it was not the first or the best action in the revolutionary struggle. We should have no illusions about what force the rich might attempt to use to stop them from keeping their status, but neither should we attempt to leap straight to confrontation before we even have the power to do anything. The democratic road is seen by the majority in society as the legitimate route to social change, and we are far from reaching its limits. This process of building up our forces, the popularity of socialism and the active participation of masses of people means keeping in contact with the real needs and conditions of the population. To produce a real movement we need to be actively involved in promoting realistic and serious reforms that strengthen our party, and other institutions in the ecology in which the party exists. The Workers’ Party was historically involved in, or indeed the main proponent of, some of the most important reform movements in Ireland’s History. These include the civil rights struggle, the Dublin Housing Action Committee, the PAYE tax campaign which saw over a hundred thousands in the streets of Dublin, anti-planning corruption campaigns, contraception campaigns, women’s rights campaigns and many others besides. These features combined to make the Workers’ Party unique among socialist parties in Ireland. A party with a socialist core, attempting to organise mass participation through the slow process of gathering forces and unafraid of putting forward realistic proposals of how to move forward. Many who are familiar with the Irish left will have heard of past decisions of the Workers’ Party which they don’t agree with. Any party which has a history and becomes relevant will have to make tactical compromises and will have taken positions which some do not agree with. Over-emphasising the importance of past choices is an error. Sinn Féin were responsible for a large numbers of civilian deaths. The Labour Party was in the same international with the Mubarak regime in Egypt and the Ben Ali regime in Tunisia, both of which brutally crushed opposition parties. And yet these choices do not preclude these parties being considered sensible choices by the electorate. It is no accident that those parties more interested in maintaining purity remain small. The only parties which will not have made questionable decisions are those which are very new; they have their mistakes ahead of them! Having a history is itself an important trait and, ideally, a party should be able to look critically at its past and make careful assessments of what went wrong. The Workers Party has the benefit of a detailed history of its genesis in The Lost Revolution, as well as an impressive archive of the historical debates that underpin its tactical and strategic discussions. These provide an important resource for critical reflection on the party, enabling us to understand why decisions were made, even if they seem wrong in hindsight. Tactical judgements are not the same thing as firm ideological positions. Agreement on the aim does not necessitate agreement on the means, and a truly democratic party must be able to embrace disagreements and ultimately yield decisions which not everyone will find to their liking. This is an essential feature of a functioning democracy. So if the Workers’ Party has the right starting material, why is it that the Workers’ Party is now so small? In 1992, the Workers’ Party suffered a serious split in which a number of TDs (including Eamon Gilmore and Pat Rabbitte) left to start their own party, Democratic Left. This happened during a period when many parties of the left internationally went into crisis due to the collapse of the USSR and the consequent fall in confidence in socialism. Some of these parties, such as the Partito Comunista Italiano, liquidated entirely. Some merely shrank in size. The Workers’ Party suffered quite badly and as a result has never since recovered the strength it had at the time. Yet the DNA required to be a mass party is still there. It’s merely a question of revitalisation rather than having to craft it from scratch. Almost all of the big left parties in the capitalist democracies are a result of such a project of revitalisation, and virtually none are the result of creating something new. This should be seen as an indicator that it is both possible, and more likely to occur in this manner. It will not be a fast process, it will take probably many years before we have a serious head of steam, but if we keep at the process of building things up carefully, we have a real chance.